I started working with a new team this summer and they have been appreciating my baking. I asked them what they would like me to bring in next and it was unanimous that they wanted something with chocolate and peanut butter. In my opinion, chocolate and peanut butter are the perfect dessert combo so I had no objection to their choice. I was on a mission to determine how you could make the two even better together and I think I found their perfect companion, pretzels. 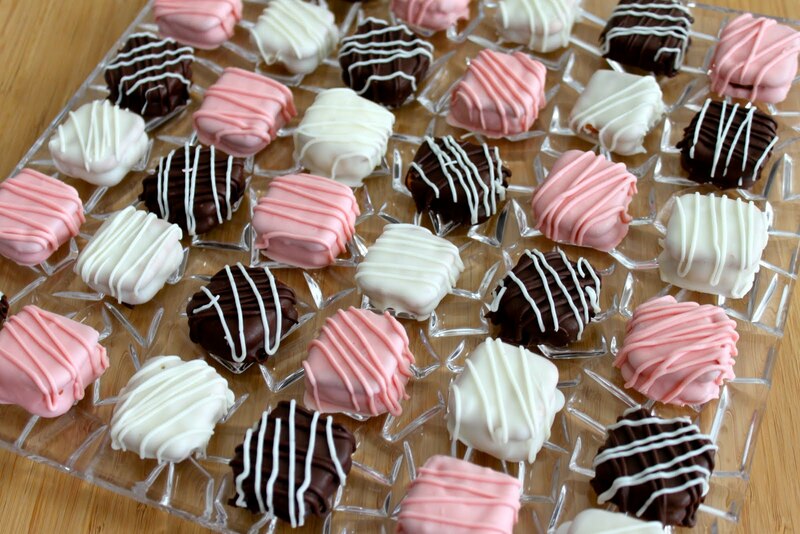 These tasty little treats are the perfect candy. They are sweet, salty, crunchy on the outside, and creamy in the inside. They are easy to make, but definitely time consuming. I think they would look great on a dessert table at a party or shower, and definitely would be a perfect gift boxed up with a pretty bow. I am already planning on making these again for the holidays. This recipe makes anywhere from 80-100 treats (depending on how much of the filling you eat a long the way), so Zack and I both brought them to work and people LOVED them. There have already been requests for me to make more. In a large bowl, mix together the peanut butter, butter, vanilla, confectioners' sugar, and salt. 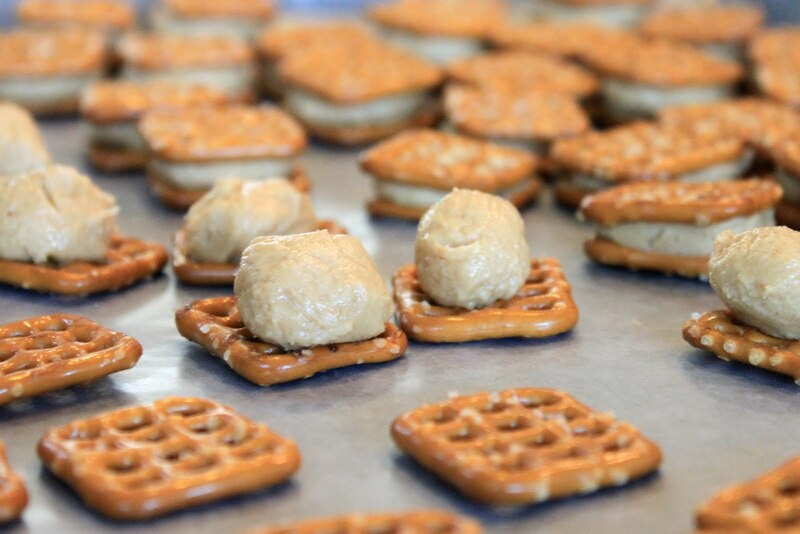 Roll into 1/2 tsp balls and place on a pretzel; top with second pretzel and place on waxed paper-lined cookie sheet. Chill in freezer until firm, about 20 minutes (See picture below to see what they look like during this step). Melt candy melts, one color at a time, in the microwave per directions on package, adding 1 tsp shortening with each color (30 sec intervals, stirring in between). Using a fork, gently dip the pretzel bite into the candy coating rotating until covered. Once covered remove and softly tap/shake until the excess chocolate falls off. Place back on wax paper to dry. 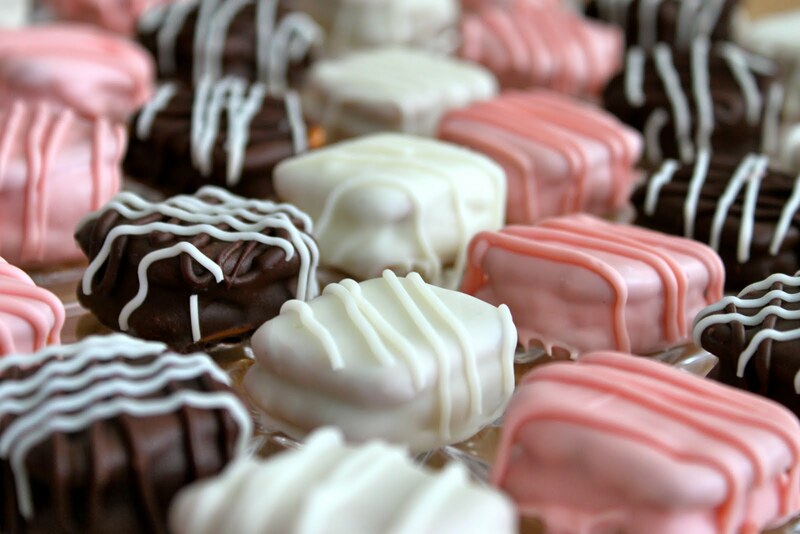 To decorate with drizzled chocolate, place excess melted chocolate in a sandwich bag. Using scissors, cut the very tip off the sandwich bag. The smaller your cut, the smaller the drizzle. Use the sandwich bag to pipe the chocolate back and forth over the pretzel bite until you reach the desired look.